The sea, or Homer – all moves by love’s glow. and, surging, roars against my pillow. A few evenings ago, as I was sitting on my couch trying to get motivated to clean, the phone rang. It was the Greek, wanting to know what I was up to and if I wanted to have dinner later…As tempting an offer as it was, I, forever Ms. Practical-Worrywart, couldn’t help but feel compelled to say no–there are so many things to do and only a handful of days until we leave for the east coast; what about cleaning and the laundry? 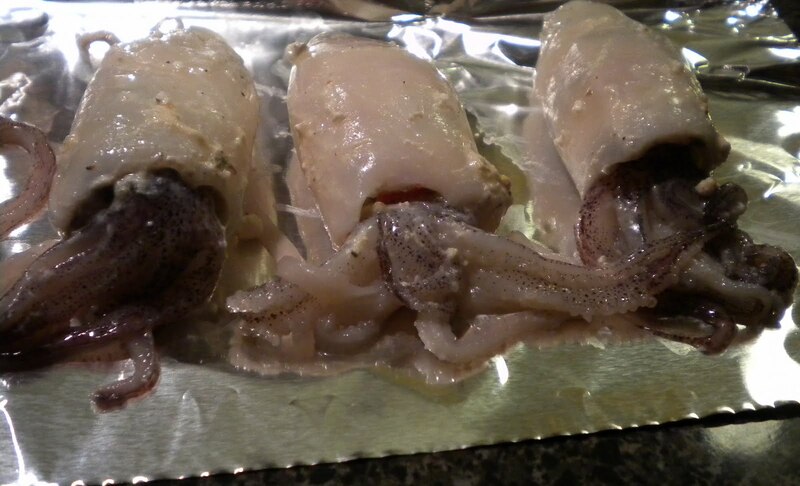 The Greek, however, sensed my reluctance and made me an offer that he knew a girl like me could never refuse: he suggested we make stuffed calamari for dinner. And not just any old stuffing either; this was all about the perfect combination of feta cheese, green pepper and tomato. Would anybody say no to such an offer? This is how two and a half hours later (I did manage to clean after all, although the laundry is still in the bushel), I found myself getting on a bus heading to Berkeley with brown rice, eggs, lemons and a few other choice ingredients in my bag. As soon as I walked into the apartment, I was immediately asked to taste the feta cheese. I took what was offered and wanted to know what was wrong with it. “What do you think is wrong with it?”, the Greek asked. 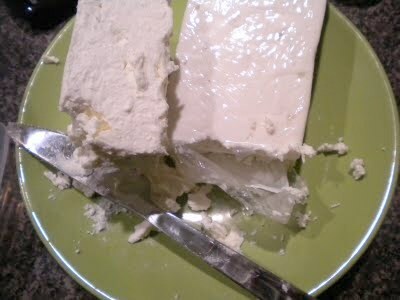 I requested a taste of the other feta and, suddenly, it was all clear: where the one was perfectly creamy and fine, it lacked taste. 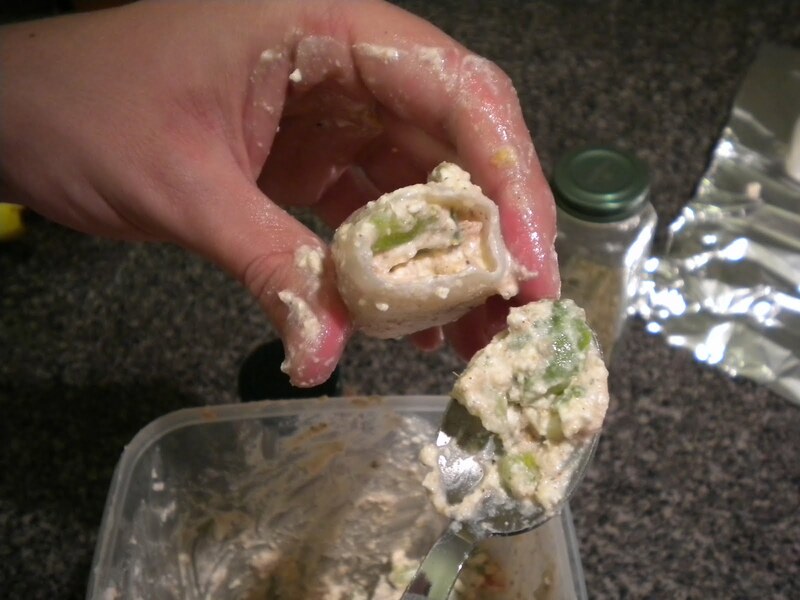 The second filled your mouth with its saltiness and had a pleasant kick to it. I asked if one was Bulgarian and the other Greek (oh, Boy C, I can only imagine the expression on your face! 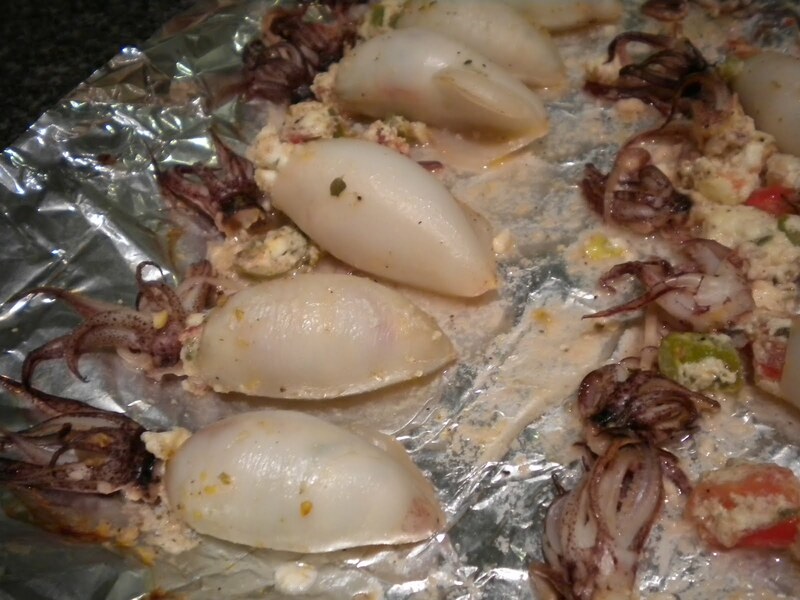 ), but it turns out that the salty feta was Bulgarian and the bland culprit….American. Alas, nobody ever said this was the land of feta! But fortunately, a happy compromise was made between the two fetas: the final product was to be half Bulgarian, half American and thus a perfectly acceptable hybrid of flavor. It soon turned into quite the evening as well. Stuffing calamari takes time and, as the Greek busily worked on that, I attempted to recreate the perfection of the rice casserole I had made about a month ago (the Trader Joe’s frozen vegetables I used, however, were not the taste I was going for; oh well. It was calamari’s night to shine!). But, since we were preparing a lot of food, the Greek invited one of his Greek friends over–a fellow appreciator of quintessentially Greek recipes like this one. Since the semester ended, she too had been enjoying her freedom by doing a lot of cooking. She even brought with her some homemade blueberry and raspberry marmalade that cleverly incorporated orange peel for the natural pectin. It was delicious–and the perfect dessert! 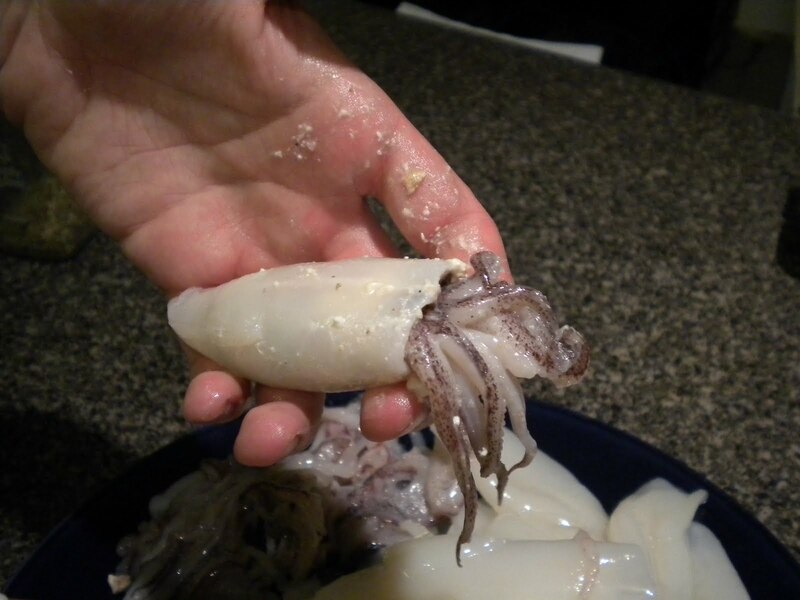 It was soon decided that, to properly enjoy the calamari and to have an authentic experience, Ouzo needed to be a part of the meal. The Greek went and got the bottle his parents had brought him and I must say that, when you compared this ouzo with the ouzo I had at the lamb roast, this one, although equally strong, was somehow softer and sweeter. 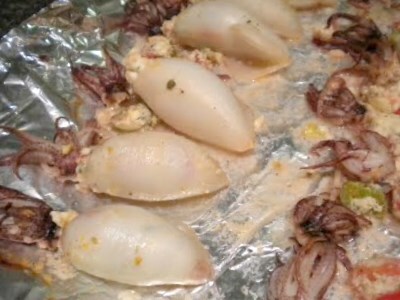 I really enjoyed it; the bitter flavor nicely complemented that salty and spicy flavor of the stuffed squid. Needless to say, it was a great evening–infinitely better than sitting around home alone and doing laundry. And given the fact that the weather here has been leaving much to be desired, the heat that we managed to generate in the kitchen from leaving the oven on for an hour plus made it feel a bit more like the Mediterranean. We had the ouzo, the stuffed calamari and the right atmosphere. All we needed to complete the setting were the crashing of the waves and an island breeze. 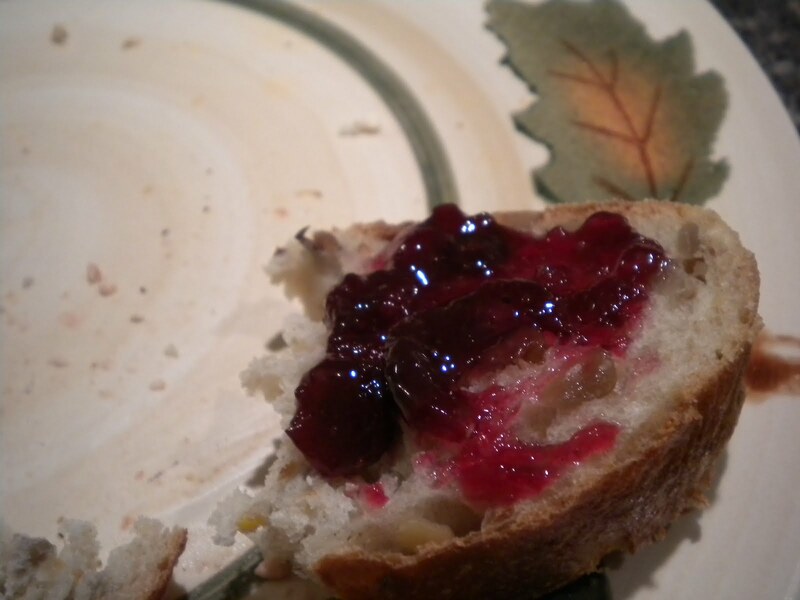 One bite of bread with the delicious marmalade, however, and I was again happy to settle for the happy medium between the Greek islands and the always satisfying taste of Berkeley produce. Since this recipe was largely the Greek’s doing and the Greek, unlike Ms. Obsessive Compulsive Me, doesn’t measure, I’m guessing on a lot of these measurements. I have, however, also consulted Vefa’s Kitchen to see what she did, so what you’re getting here is a combination of the what I observed in the Greek’s kitchen and what the Greek standard according to Vefa is. The one thing I’m adding that we did not make is the sauce. This, I think, would have greatly enhanced the flavor because, between me and you, fish was simply meant to be dipped in a sauce of lemon juice, olive oil and spices. But even without sauce, this dish is sure to make a pleasing addition to any summer table. -Mix the feta, diced bell pepper, tomatoes, spices, lemon juice, cayenne, salt and pepper in a large bowl. The mix should be crumbly and creamy. 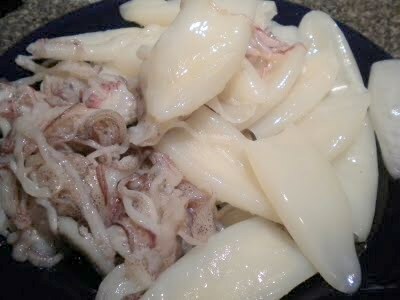 -Take the body sacs of the squid and, with a small spoon, stuff them until they’re about 2/3 full. 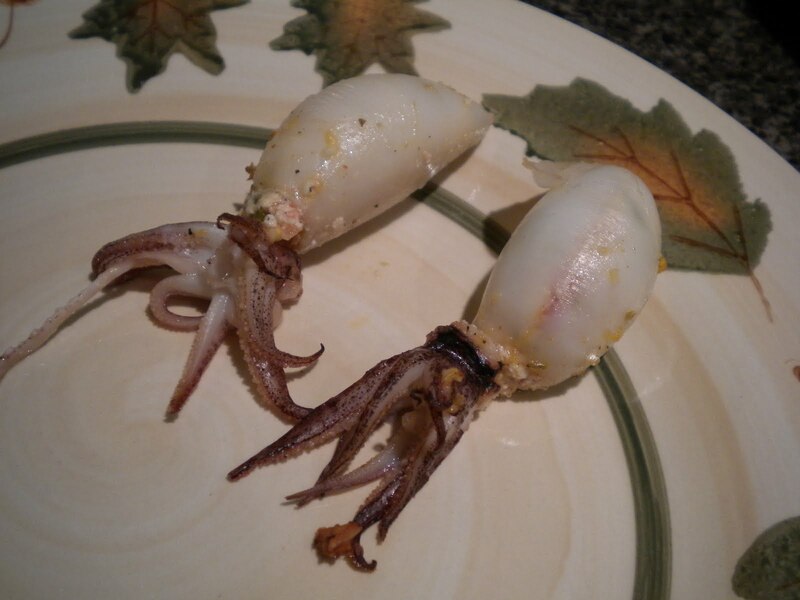 -Place the tentacles in the sac’s opening and secure with a toothpick (we skipped this step and it turns out that squid shrinks as it cooks, which means that the the carefully placed tentacles ended up separating from the sac). -Combine lemon juice, olive oil, parsley and salt and pepper and mix vigorously–either with a whisk or, if in a covered bowl, by shaking. -Brush squid with lemon juice and olive oil mixture. -Bake at 400 degrees for 25-30 minutes, or place under the broiler for about 10-15. These were our options due to our lack of a grill, but, according to Vefa, 7 minutes on each side would do the trick on your average grill. Oh my goodness this calamari looks awesome!!! I can't wait to see if I can make. They are gorgeous! Like little works of art. Yum. Ha ha, I think it's my first shout-out in a blog. I *really* do try to be objective about my national… affections or whatever, and I'm not even one for super salty foods! But I do know that like *everybody* prefers Bulgarian feta. Glad you did too. 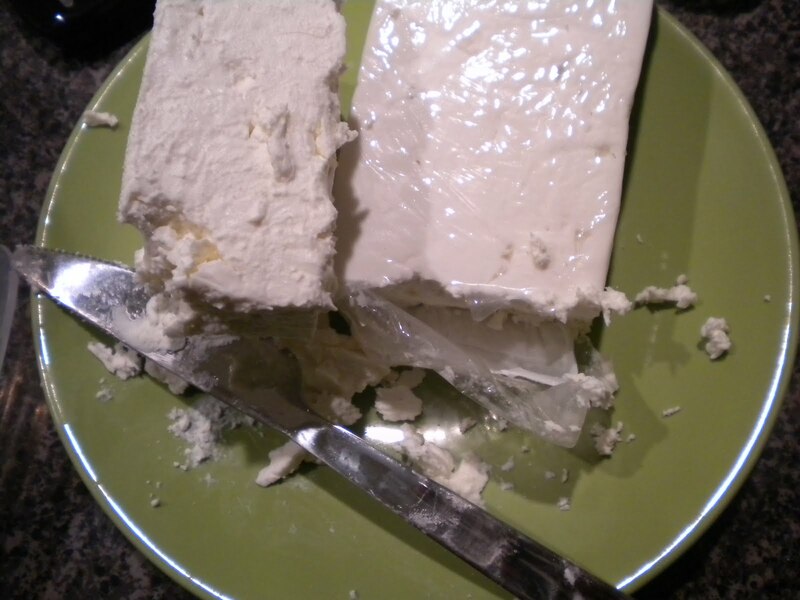 -And, Boy C, I did enjoy the Bulgarian feta…but to say that I prefer it might be too strong… =P Hope all is well in Serbia! Eek! Don't think I'd be brave enough to try the calamari, as impressive as it looks. But maybe I would after a couple glasses of Ouzo. 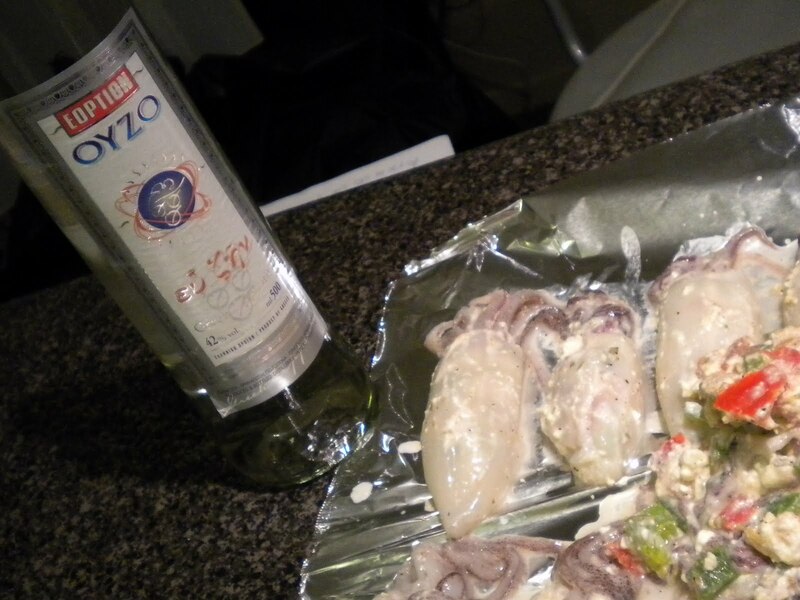 Both the ouzo and the calamari can be arranged, Colleen!